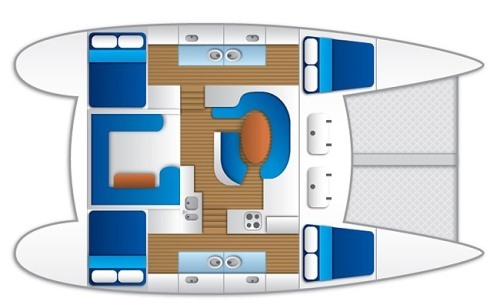 Ideal for groups of 8 with 4 private cabins - great for couples! 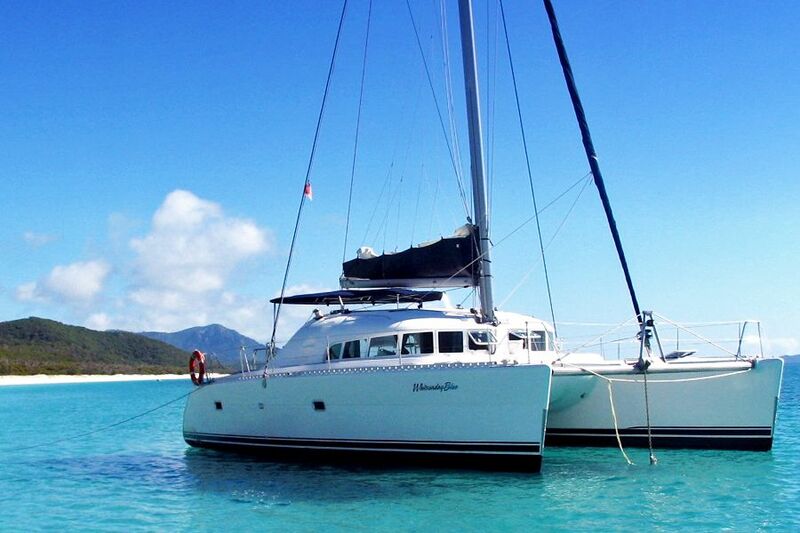 Go on your dream holiday on board Whitsunday Blue for an exclusive Private Charter. With your family and friends, you can enjoy your trip exactly the way you want, with a flexible itinerary designed around you! Your customised tour allows you to indulge in all the exciting activities and destinations the Whitsunday Islands have to offer, doing exactly what you want. Bring your family and friends to paradise for the ultimate escape. Explore, snorkel and paddle board your way through the stunning Whitsunday Islands and inner fringing reefs. Tap the hotspots on the floor plan below to view Whitsunday Blue. Wander the pristine white sands of Whitehaven Beach, and swim in the calm shallow waters that surround. As one of the most famous beaches in the world, it no wonder this is the third most photographed place in Australia! Guided by your crew, you will take a short bushwalk up to Hill Inlet Lookout, where you will get to see the unforgettable view from above. The sands of Whitehaven Beach and Hill Inlet are never the same twice, with unique swirling patterns that will take your breath away. The Whitsunday Islands are home to some of the most colourful and diverse corals in the world. Dive on in and experience the magic of this underwater paradise for yourself as you snorkel and swim in secluded bays and coves. Great for spotting turtles and other marine life, stand-up paddle boards are becoming popular all over the world. Guests are welcome to take Blue's paddle boards for a spin around the boat or reef, enjoying the view as they make their way around. Known for calm waters, quiet anchorages, and beautiful islands to explore, the Whitsunday Islands are a sailing and boating paradise! Its beauty will leave you in awe as your crew sail you to some of the best places the Whitsundays have on offer. *Private Charter itineraries are flexible. You can work with your crew to plan out your perfect holiday on board Whitsunday Blue! All meals are included while on charter. Please see the sample menu for a standard 2 Day, 2 Night and 3 Day, 3 Night charter here. BYO alcohol. Regular charters depart from Abel Point Marina in Airlie Beach. A Hamilton Island pick up and/or drop off may be available upon enquiry. Hamilton Island pick ups and/or drop offs incur an additional cost and are deducted out of the scheduled charter time period. Children under the age of 18 years are considered upon enquiry (no infants). Whitsunday Blue does not supply child sized equipment such as wetsuits, snorkelling gear or life jackets. It is the responsibility of the parent/guardian to ensure these are obtained from elsewhere beforehand and brought on board for departure. We require a deposit paid by card to secure the booking. The remaining balance is due 2 months prior to travel and is payable by either card or bank transfer. Longer charters (5 days, 5 nights) are available upon enquiry. We recommend booking well in advanced as private charters are only available so long as no other passengers book on. Please contact our reservations team directly for all questions, enquiries, and bookings. We are online 24/7 via live chat, emails and phone. Excess luggage can be stored at several places in town including most boat check-in offices, most hostels, at your accommodation, or at Airlie Beach Bag Storage. Most charge between $5-10pp for the duration of your trip. Whitsunday Blue does not supply child equipment (life jackets, stingersuits, fins, masks etc.). ALL child equipment must be purchased/hired elsewhere prior to departure. BYO alcohol - no glass bottles, with the exception of Wine and Champagne. Soft drinks and bottled water available for purchase on board. Please note, at time of booking we require a deposit with the remaining balance due 2 months' prior.